So, several months later, house move complete and it is time to get a shack operational again. I am a fan of keeping things running when the power goes out. From a Amateur Radio Communications perspective, I have had a 80Ah battery in the shack for over 10 years and I have been using a West Mountain Radio Super PWRgate PG40S and Rigrunner 4010S to power my radio equipment and to keep the battery charged. My current ‘desktop’ is based on a Intel NUC 7i7BNH these along with their LCD’s are running off an older APC Smart UPS 1500, which gives between one and two hours of run-time should the power go out. While everything was in boxes, I purchased a West Mountain Radio EPIC PWRgate (I wonder what adjective will be used to describe the 4th Generation!) this device can charge Lead Acid, AGM/GEL and LiFePO4 Lithium battery types, and, what attracted me to it is that it has a built in Photovoltaic (PV) Charge Controller. 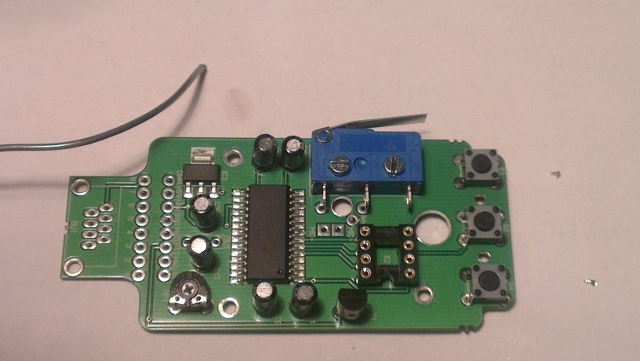 Which removes the need for a dedicated Charge Controller. Sometime during the move, the old AGM battery died (Ophelia was its final ‘performance’). New shack, new battery, a Trojan EverExceed ST-1280 was ordered from O’Connell Batteries in Cork and duly arrived. Plug-and-play? well not-exactly. After looking at the specs, the default ‘AGM’ setting in the Epic PWRgate needed some adjusting to avoid overcharging the battery. The battery specifications say 2.35 Volts per cell (for 12 hours), so the ‘Max charge voltage’ needed to be dropped from 14.4 to 14.1 volts, and the PSU set to 14.2. On Linux, the Epic PWRgate appears as /dev/ttyACM0, guessing I used 115200, N81, no handshaking and its console immediately popped up. Hopefully the battery is as reliable and lasts as long as the last one! Late last year, it was suggested at a Tipperary Amateur Radio Group club meeting that we should do something ‘different’ in 2017. The suggestion was made to Activate a Lighthouse for the International Lighthouse and Lightship weekend. Given the lack of lighthouses in Tipperary, I made the suggestion that we use Ballinacourty Lighthouse. I had assisted EI2GN with an activation there years before and my recollection was that it was quite accessible. Due to work commitments, I was late down to the site so kudos to EI3ENB, EI2HI, EI4KN and EI5JF for getting everything set up. I thoroughly enjoyed the operation before I had to head away again. Andy, EI5JF, made a short film (and took some pictures) of the operation, which isn’t too bad considering the material he had to work with! What weekends are for! Wake up, get the billy on and think about what to do for the day. Getting the billy on first thing in the morning. Last weekend, I joined other members of Tipperary Amateur Radio Group on the farm of Paul, EI3ENB for the SSB Field day. EI5HBB in Search and Pounce mode. 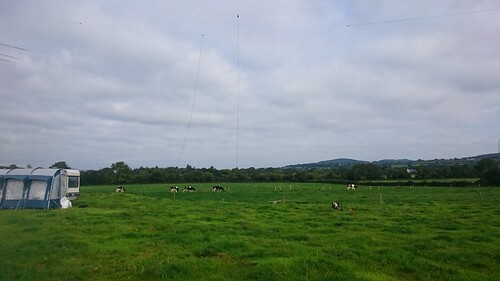 40m and 80m Dipoles, with the Tribander at the left of the picture. 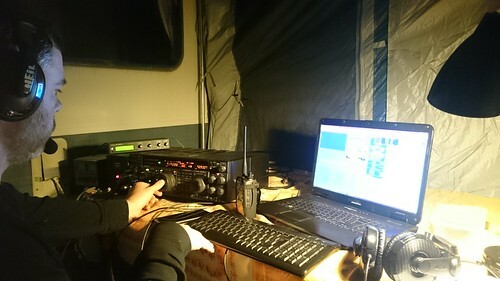 Unfortunately we weren’t able to get any decent runs going on 20m or 15m which would have helped our score quite a bit, however Eoghan, EI5HBB was at the microphone when we got a decent run on 80m for about 90 minutes in the early hours of Sunday morning. 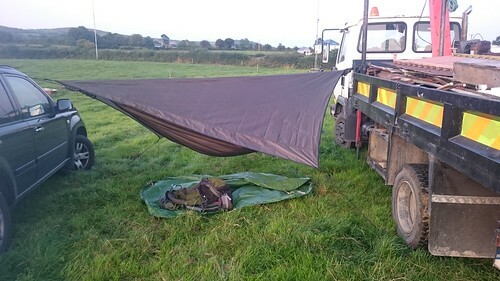 My comfortable accommodation for the night. 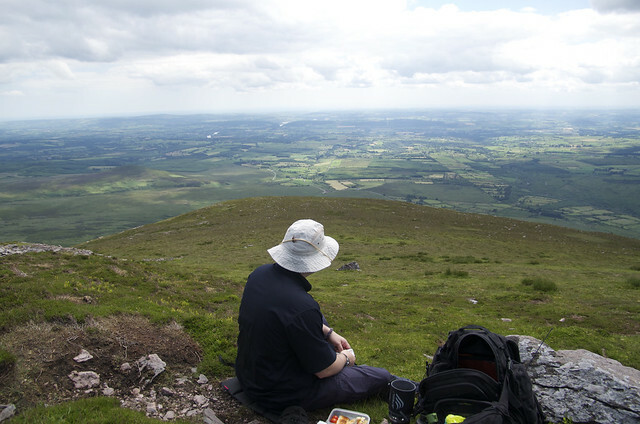 I had two completely different outdoor experiences this past weekend, both hugely enjoyable in their own ways. 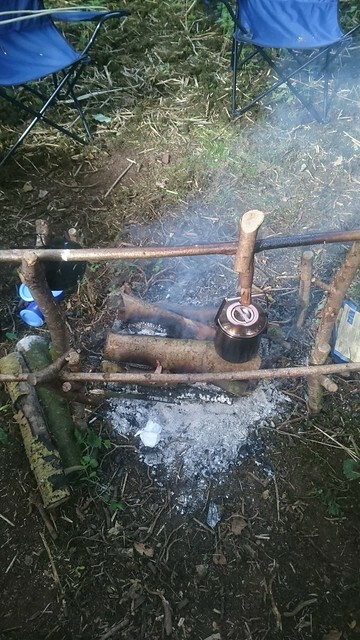 Saturday I took a trip in a Canoe (my first ever) with the Into The Wild Survival. 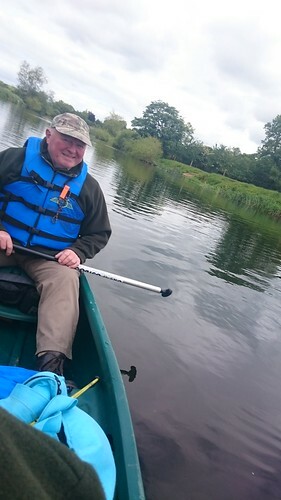 Four of us were sheparded down the River Suir by Frank Deegan and John McGrath (John is pictured below). 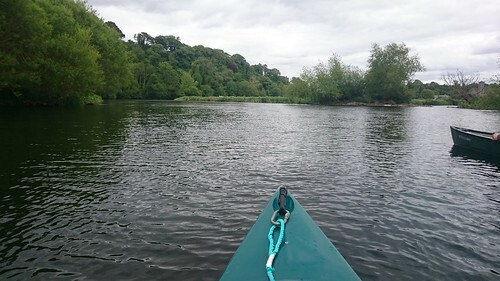 We paddled from the Swiss Cottage in Cahir to Clonmel on Saturday, camped overnight on the river bank, just east of Clonmel, then continued on from Clonmel to Fiddown on Sunday. A long trip, though very tiring, it was very enjoyable and I really can’t wait to get out for another trip. Some videos Frank took during the trip. You can see my best side in the clip below (I’m in the white hat). Monday and Tuesday were a different story, two days at Millbrook Off Road Centre (Lantra accredited), being instructed on the finer points of driving off road. Kevin, Thomas and their team were excellent to work with, great instructors. Below is a taster of what you can expect. They are having a 4×4 Festival the 11th and 12th of July, definitely worth checking out (get off the M9 at Castledermot). In summary, a thoroughly enjoyable way to spend a “long” weekend! I don’t have any ambitions to be a lorry driver, but for years I wanted to learn and get the licence. Possibly from watching too many re-runs of Smokey and the Bandit, or maybe just from watching my late uncle Hugh drive past our house to collect cattle when we were small. I eventually decided to get my act together about 12 months ago and started by passing a test in a mini-bus (D1) in January. No sooner had I done the test, I was using my newly acquired licence in support of the larger community where I live, nothing dramatic, but quite satisfying to give something back, and quite a different experience to anything I’d driven before. With that under my belt, I got brave and started lessons in a rigid truck (C), passing that test in May. I did not find it that much of a step up from the mini-bus, just a different focus to the driving, and a different way of “chucking it about” (and a very patient instructor). Throwing caution to the wind, I applied for an Artic (CE) test. Green as grass, and with little or no “wheel time”, oh man, did I get a shock when the lessons started. Thinking about it now, having passed the test this morning. Various factors conspired against me the last few weeks and I probably should have cancelled the test, but this morning, even though I got mixed up in what order I should raise my legs and plug in my suzies, the driving gods smiled down on me. No cyclists swerved into my path without looking, no pedestrians walked out in front of me while chatting on their mobile phone (oblivious to 15,940kg rolling towards them), all drivers went where they were indicating, and I nailed my off-side reverse. Boy am I smiling inside tonight! 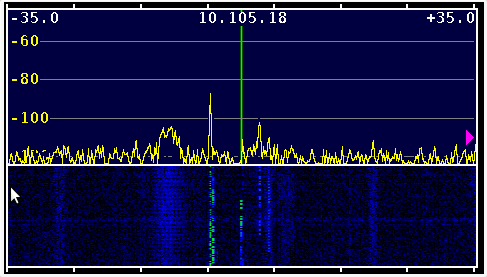 Hide in the network. Implement hidden services. Use Tor to anonymize yourself. Yes, the NSA targets Tor users, but it’s work for them. The less obvious you are, the safer you are. Encrypt your communications. Use TLS. Use IPsec. Again, while it’s true that the NSA targets encrypted connections — and it may have explicit exploits against these protocols — you’re much better protected than if you communicate in the clear. Assume that while your computer can be compromised, it would take work and risk on the part of the NSA — so it probably isn’t. If you have something really important, use an air gap. Since I started working with the Snowden documents, I bought a new computer that has never been connected to the Internet. If I want to transfer a file, I encrypt the file on the secure computer and walk it over to my Internet computer, using a USB stick. To decrypt something, I reverse the process. This might not be bulletproof, but it’s pretty good. Try to use public-domain encryption that has to be compatible with other implementations. For example, it’s harder for the NSA to backdoor TLS than BitLocker, because any vendor’s TLS has to be compatible with every other vendor’s TLS, while BitLocker only has to be compatible with itself, giving the NSA a lot more freedom to make changes. And because BitLocker is proprietary, it’s far less likely those changes will be discovered. Prefer symmetric cryptography over public-key cryptography. Prefer conventional discrete-log-based systems over elliptic-curve systems; the latter have constants that the NSA influences when they can. If you haven’t already read the full post, you should.